Add a little Christmas sparkle to your tree. 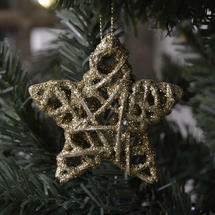 Pretty sparkly gold Christmas tree star decorations. Made in woven wicker and covered in lovely sparkly glitter.